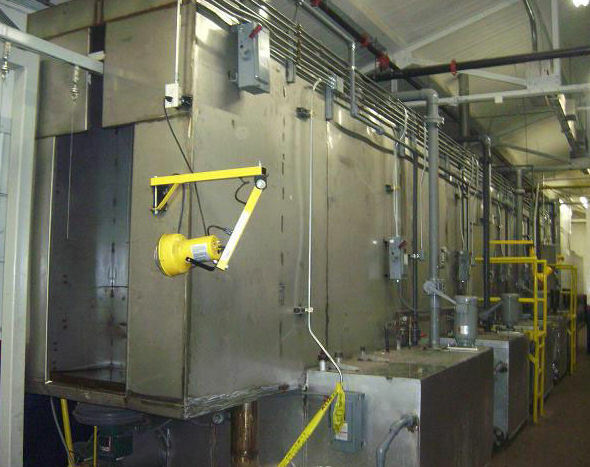 Fabricated Products offer two Painting Processes; a conveyor coating plant and a batch process plant for powder and wet spraying. The conveyor-operated powder coating plant facilitates larger batches of components to be processed efficiently in a full range of colours and finishes. Components are masked and hung on a monorail overhead conveyor. and carries them away with it, to create sludge, which is removed from time to time. Stage 2. Initial cold rinsing with water. Stage 3. Another cold rinsing to eliminate any remaining alkali. adhesion on metal and increase corrosion resistance. susceptible to rust. Deoxylte 7100 minimises this risk. At this stage parts are dried in an oven at 180°C, in preparation for the application of powder. Parts travel through the spray booth and automatic electro-static spray guns apply measured amounts of powder. This automated system is supplemented by manual application of powder e.g. for surface areas that are not easy to reach. Any excess over spray is re-cycled through a recovery system, to minimise environmental consequences. The last stage in this process is the curing oven which melts the powder coating onto the part, giving a strong, high-quality finish. Batch process plant for powder and wet spraying. 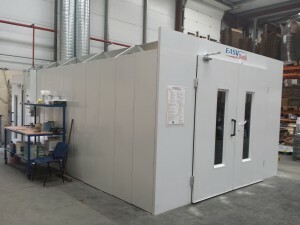 A manual spray booth is used for both smaller batches and for larger individual components to be processed. A number of quality checks are implemented into our paint and powder processes and these include a thickness test to ensure that the density of coat is sufficient, visual checks to confirm a smooth finish and an impact test to ensure the powder adhesion is strong. Fabricated Products offers a number of related services such as Plating, Silk Screening and Pad Printing. Learn more about our comprehensive set of Capabilities and please do contact us to discuss your requirements.